Manila, Philippines – Speaker Gloria Macapagal-Arroyo on Monday hosted a thanksgiving lunch with Davao City Mayor Sara Duterte, daughter of President Rodrigo Duterte and ally lawmakers, a week after Arroyo’s installation as House speaker. “She (Mayor Duterte) was invited by the speaker but she did not speak. She did not make pronouncements,” Deputy Speaker Fredenil Castro of Capiz said. “There was luncheon of members of the House with Speaker Arroyo. Nothing was discussed other than expressing her appreciation for all those who supported her and urging everybody to start working on matters pending with the House, and there was also an announcement that we might able to elect certain officers of the House,” Castro added. Mayor Sara reportedly admires Arroyo, and speculations also came out that she was the strong force behind Arroyo’s rise into speakership. Sources said that the President’s daughter burned the lines to marshal support for the former president. Subsequently, stores went around saying that PDP-Laban members mulling jumping ship to the Davao City mayor’s Hugpong ng Pagbabago (HNP). “She (Mayor Duterte) was there to say hello. Nothing was discussed about any coalition,” Castro said, but disclosed that a number of political parties came well represented. “As former Speaker [Jose] de Venecia used to call it, it was a rainbow coalition,” Castro added. Sara’s HNP, a ‘political force’ to reckon with, is what Senator Ping Lacson said on Monday. Lacson made the remarks as Arroyo threw lunch as thanksgiving to lawmakers, including Ilocos Norte Rep. Imee Marcos, who have helped get her elected as House speaker. “Accept it or not, Mayor Sara Duterte’s HNP has already emerged as a political force to reckon with, not only in her region but the national political scene as well,” Lacson said in a text message per Manila Times. Lacson, was once a fierce critic of the former president said: “I still believe that no person is beyond redemption.” – referring to Arroyo. “Regardless of her past ‘sins’ against the Filipino people, she may have regretted all those and make time for genuine and selfless service to the nation. Or so I hope,” he said. Earlier, Lacson issued a stern warning to any moves to amend the 1987 Constitution that would pave the way for Arroyo to become the country’s prime minister. 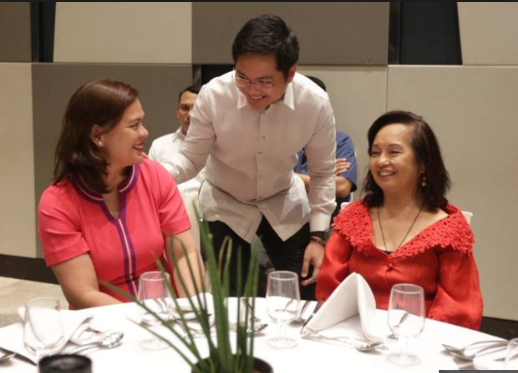 “If GMA’s (Arroyo’s initials) ascension to the speakership is a prelude to becoming prime minister, they better think twice because the Senate, both majority and minority have agreed to close ranks to defend and assert our role under the 1987 Constitution in revising or amending the same,” he said in a text message.” Lacson told the media in a text message. “That, I can say with certainty and conviction,” the senator added. The Senator said the last incident at the House of Representatives remains a “strong argument” against changing the form of government to federalism. “Regardless of whether it was GMA (Arroyo’s initial) or somebody else replacing the ousted speaker, what happened yesterday is a strong argument against a parliamentary form of government where patronage politics plays a major, if not the only role in selecting our country’s top leader,” Lacson said the following day after Arroyo’s becoming the House speaker.